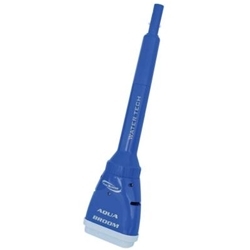 The Aqua Broom battery powered cleaner is perfect for vacuuming spas and small inflatable pools. Now you can easily clean the grit and debris from your spa or small pool with the Aqua Broom. This powerful cleaner uses battery power to provide up to 3 hours of cleaning time. All debris is vacuumed into the unit's own reusable, easy to clean filter bag. Aqua Broom is light weight 3 lbs and can be hand held in the shallow areas or attached to a telescopic pole (not included) for deeper parts of your spa or pool. 1 Year Warranty. Requires 5 - D Batteries, not included.